"Besides my wife and 2 kids, I own..."
and he goes on to list all of the expensive toys he's bought since he became a multi-millionaire. Things like helicopters and yachts and cars that you've only ever seen at those weird auto shows where they still pay models to stand by cars, sell you a fantasy. It's opulent and outrageous, but Belfort's lifestyle is entirely summed up by the phrasing of that line. He's not just looking to own THINGS, he's looking to own EVERYTHING, including people. Everything can be bought, sold, traded-in for the newest model, especially wives. The portrait that is painted by Scorsese, DiCaprio and company of American greed isn't just disturbing, it's disturbingly truthful. The film, based on a Jordan Belfort's memoir of the same name, is the story of Belfort's own rise and fall. A blue-collar kid from Queens, he is lured to Wall Street and its promises at the peak of its power, the Gordon Gekko era, the late 80s and early 90s. He gets an entry-level job, before passing his Series 7, and befriends his new boss, Mark Hanna (Matthew McConaughey in a sublime cameo). Hanna encourages Belfort to take whatever steps he needs to take to cope with the stress of the job. Any addiction that CAN be had, SHOULD be had is the essential advice given to Belfort in the single greatest lunchtime meeting scene ever put on the screen. After the stock market crash of 1987, Belfort is unemployed and eventually accepts a job trading penny stocks. His commission on these completely crap investments are insane, and pretty soon he's almost making more money than he can spend. I say "almost" because if there's one thing Belfort is better at than swindling poor people out of cash, it's knowing how to spend their hard-earned money to make his life more comfortable. Enter Donnie Azoff (Jonah Hill) in to this story, and it starts to become a full on scheme of a lifestyle. Donnie has all of the subtlety of the broad side of a 2x4. His teeth (seriously, THOSE TEETH), his hair, his glasses, his sweater around his shoulders; Donnie looks like an alien came to earth, looked at every Ralph Lauren ad from 1985-1988 and put it all together in to one preppy rich-boy wannabe package. Donnie doesn't earn the money that Jordan does, but he is desperate for the kind of lifestyle that could afford. So he joins forces with Belfort and in a dingy warehouse, they start up their very own, mostly fake company, Stratton Oakmont. The set-up of Stratton Oakmont is easy: pitch the script, sell one decent stock, and then get those investors to invest in the same horrible penny stocks he was selling before, and pretty soon, you'll be making more money than you can stuff in 4 mattresses, every single day. Oh, life is like that. Sometimes, at the height of our revelries, when our joy is at it's zenith, when all is most right with the world, the most unthinkable disasters decend upon us. And unthinkable disasters do descend. The FBI starts to close in on Stratton Oakmont's fraudulent business practices, his second marriage to the self-styled "Duchess of Bay Ridge", Naomi (played brilliantly by newcomer Margot Robbie), a former model, starts to wane as Belfort's addictions spin out of control and soon, there is no way out of the illusion that Belfort has created. Inevitably, Belfort has to pay the government piper, both with money and jail time. On a strictly technical level, this film is a standout. Working once again with long-time editing partner Thelma Schoonmaker, Scorsese delivers a film that looks fresh, despite its late 80s and early 90s time period. It's bright and vibrant, with pops of color that make it feel more like a music video than its more dour-paletted topical predecessors, Wall Street and Amerian Psycho. Despite the shadiness of the business transactions, most of the scenes take place out in the open, in the bright, almost blinding sunlight. I'm pretty sure there's a metaphor there, but I don't want to be too presumptuous of Mr. Scorsese's intentions. And despite its nearly 3-hour running length, there is not a wasted moment in any scene. But more importantly, let's talk about the performances that Scorsese gets out of these actors. Ever since he first brought Leonardo DiCaprio on board his projects with Gangs of New York, it's only seemed to be a mutually beneficial relationship. Leo finally became a man, like a capital M-A-N under Scorsese's supervision, and the performance he gives here is one that, I fully believe could have only been given under circumstances of complete trust. The scene where the Lemmon Quaaludes begin to kick in is easily the most impressive physical work I've ever seen from DiCaprio and might be some of the best work I've seen from anyone in years. And it's not just that scene but every scene. And you know why it all works? Because, we, the audience, already see Leo as a nearly Belfort-esque kind of guy. He's handsome, he's charming, he's got charisma for days, he's rich beyond our wildest dreamings, and that's just DiCaprio himself. We already buy that he's Jordan Belfort because, well, he's in that completely outside celebrity range anyway. In a way, he's skewering our expectations as well as mocking Belfort's activities at the same time. Margot Robbie and Jonah Hill are no slouches either. Hill's role (nominated yesterday for an Oscar) is a flashy, smarmy piece of greatness. Oh my what teeth he has indeed and he sinks them in to every single scene. There isn't a forgettable moment he has, and none more devastating than his ultimate betrayal of his mentor. While Belfort is the cocksure leader, Azoff is the real snake of the Wall Street jungle, and perhaps, the only one with a stronger self-preservation mode than Jordan, which, is really saying a lot. Meanwhile, Robbie's Naomi is the complex female role that any young actress would have probably given her Leboutin heels for. It's easy to dismiss her as a gold digger, but there is so much more than that going on. She is smart, cunning, and predatory througout, but never more than at the end where, in a masterfully tactical move, she announces her desire for a divorce. See, Belfort's problem is that, not only did he think himself untouchable, he surrounded himself with people whose survival instinct matched, or even surpassed his own. It's never good to be the low man on the totem pole when you made everyone else BUILD you the totem pole. And let's talk about Belfort for a moment, let's lay the cards out on the table right now. He's a pretty terrible human being. 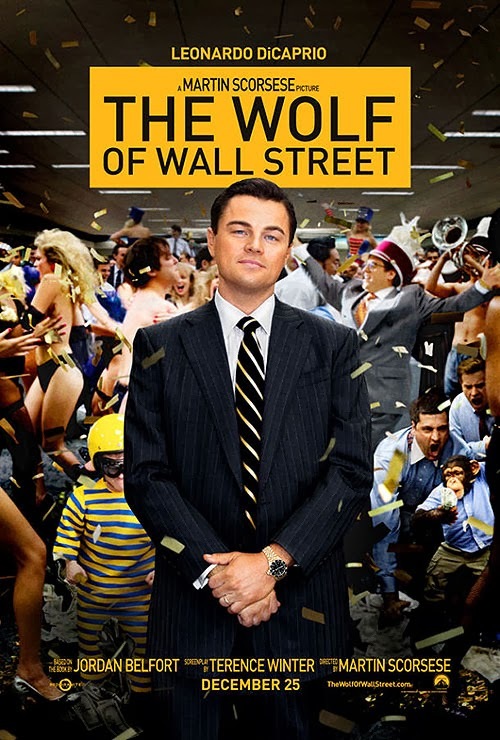 Early reactions to this film indicated that a frightening number of people believed that this was a movie that glorified the pre-bust lifestyle of these financial types, riling people up to the point that they were basically screaming at the top of their lungs "How DARE you Scorsese". Well I would say that I don't mean any personal offense to those people, but we all know when you say things like "no offense," the next thing that comes out is invariably an offense, so I'll simply ask, directed to those people who thought they were shaming the film, what particular brand of hallucinogens were you on when you were seeing that movie?! Did we see the same film? Because if we did, there's no way in a frozen, hellish tundra that the film glorifies anything about that lifestyle. It's practically specifically designed to make you say "Gosh, I really hope I never end up like that dude, because he's literally the worst". This isn't a film about "survival" or "getting away with it", people, this is a film about addiction. It's about America's addiction to Lifestyles of the Rich and Famous just as much as it's about pills or booze. It's an interesting question to ask "Just how did Jordan Belfort end up like that?" because, despite our desire to ascribe meaning to everything, it really seems like the answer is, "he just wanted to". His family, especially his father (portrayed by Rob Reiner in an equally great scene-chewing role) seems surprisingly grounded. It probably turns out that his parents were just as equally charmed by his Devil-May-Care attitude as the rest of his followers, but if there's any lesson from The Wolf Of Wall Street, it's that the Devil certainly does care, especially when it comes to fraud and tax evasion. While in real life, Belfort still continues to, mysteriously, make more money than he reasonably should and avoids paying the government back what he took from gullible investors, I'd like to think that ultimately what this film would do would motivate people to be angry the way the should have been years ago. These are the people that are taking your money everyone. The problem is, we were willingly giving it to them in exchange for a shot at the American dream, except it turns out their promises were just as empty as the fast-food philosophy on which their pitches were based.